Pablo Hernandez is frustrated in defeat with Leeds United team-mate Rob Green. Picture: Tony Johnson. Head coach Garry Monk reckoned Leeds United were unlucky to see their unbeaten run end as they went down to a narrow defeat away against play-off rivals Reading. A solitary first half goal from Yann Kermorgant proved the difference between the teams and the 1-0 win took Reading above the Whites into fourth place in the EFL Championship. Reading had more good chances to be further ahead in the opening half, but Leeds had opportunities too and were dominant in the second half without being able to test home keeper Ali Al-Habsi enough. 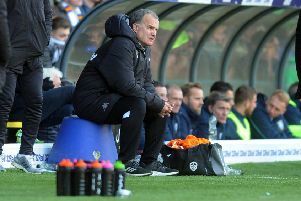 The game could prove more costly than just the points for Leeds as they may face losing defender Liam Cooper to a long suspension after he appeared to stamp on Reece Oxford in the second half. The referee and his assistants seemed to fail to spot the incident so the FA may now intervene as they did in the recent Premiership game between Manchester United and Bournemouth when the latter’s Tyrone Mings was banned for five matches for a reckless stamp. If they do they should also take action against Reading defender Tyler Blackett who got away with an elbow in the face of United’s Chris Wood in the first and should have been red carded. Monk said he did not see the Cooper incident, but backed the player as the not the sort to do something like a stamp deliberately. He also felt his side had been worth a point after their efforts in pushing Reading back in the second half. He said: “We had our chances to get the goals and could have easily scored a goal. “The group’s effort in that second half shows where they are. Leeds had Chris Wood in their team after he flew home early from international duty with a knock, but Pontus Jansson missed out with a hamstring injury and Monk went with the team that beat Brighton before the international break. They could have been ahead early when Pablo Hernandez sneaked in behind the home defence only to get a weak contact to his attempted first time flick, giving Al Habsi an easy save. Reading had a good chance soon after when Roy Beerens played in John Swift, but he could only fire his effort over despite being well placed in the area. Leeds were looking threatening in the first quarter as Al Habsi missed a Hernandez free-kick and Kyle Bartley found himself unmarked at the back post only to head the ball into the side netting. Alfonso Pedraza then dragged a shot wide after Charlie Taylor’s low cross was only cleared to him on the edge of the box. However, it was Reading who opened the scoring in the 21st minute as Leeds were caught by a quick throw. Taylor spotted the danger, but his diving clearing header fell to straight to Kermorgant who then produced a shot that was too powerful for Rob Green to keep the ball out, although he got a hand to it. The instant response was good from Leeds with Chris Gunter lucky to see his sliced clearance going safely into the hands of his keeper as he got to Hadi Sacko’s low cross just ahead of the lurking Pedraza. But Reading fluffed two good chances inside a minute. First, Roy Beerens raced clear onto Swift’s ball over the defence only to shoot over then Garath McCleary was clean through down a huge hole in the middle of Leeds’ defence, but Green was out swiftly to save. After the latter, United broke swiftly and Hernandez got on the end of a fine low cross by Pedraza only to shoot wide on the stretch. Right at the end of the half, Kermorgant came within inches of doubling Reading’s lead when his shot from the edge of the box hit the post. The hosts had the first good opportunity after the break as Beerens was in space in the box only to lose control of the ball with only Green to beat. That was virtually the last seen of Reading in attack, however, as they were pushed back for the remainder and settled for defending deep and time wasting at every opportunity. Al Habsi saved Hernandez’s shot from the edge of the box that looked to be going just wide. Cooper then stabbed the ball wide after Hernandez’s corner was headed down by Bartley. Substitute Souleymane Doukara tried to make something happen for Leeds and he got in a shot from distance that was fumbled by Al Habsi. Luckily for him the ball was going wide and a corner was the only result. Al Habsi was brought into the action again to save comfortably from Ronaldo Vieira’s shot in a crowded goalmouth and Reading held on through nearly seven minutes of added time in which their gamesmanship made sure they went to the final whistle without further alarm. Reading: Al Habsi, Gunter, Moore, Blackett, Obita (Oxford 74), Kelly (Mutch 67), Williams, Beerens (Grabban 60), Swift, McCleary, Kermorgant. Leeds: Green, Berardi, Bartley, Cooper, Taylor, Bridcutt, Vieira (Roofe 86), Sacko (Doukara 60), Hernandez, Pedraza (Phillips 67), Wood.